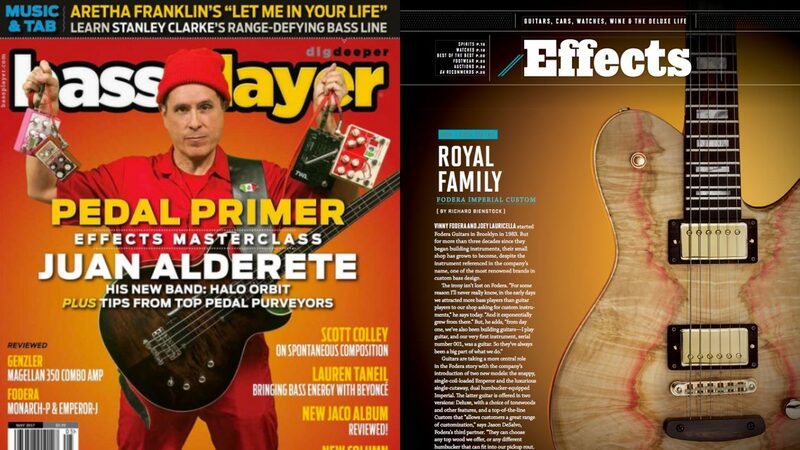 Fodera Guitars featured in both Bass Player Magazine and Guitar Aficionado! This month, Fodera guitars is honored to be featured in both Bass Player Magazine and Guitar Aficionado! In Bass Player Magazine editor Jonathan Herrera puts our latest Emperor-J and Monarch-P Classics through its paces. Both basses were noted for their flawless construction and attention to detail as well as their superior tone and playability. In this month’s issue of Guitar Aficionado our Japanese Maple Imperial Guitar, which debuted at this year’s NAMM show, is featured as part of their ‘New + Cool’ column! In their editorial, Vinny and Jason provide some history about our electric guitars and what sets a Fodera electric guitar apart from the rest. Both issues are currently available on newsstands and each article is available to read by clicking below.